Wondering what are the best organic crib mattresses? In a sea of choices, let me help you choose which ones are truly non-toxic. A well-made organic crib mattress is one of the most important items in your baby’s nursery. Since your baby will spend thousands of hours in their crib, a crib mattress is one of the most important investments you will make as you prepare the nursery. Sadly, most crib mattresses are a major source of toxins, exposing babies to high levels of chemical emissions while they sleep. Crib mattresses [release] nearly 30 different types of volatile organic compounds, or VOCs, and other potentially harmful airborne chemicals such as endocrine-disrupting phthalates and fragrance allergens. The chemical safety of your baby’s crib mattress is of the utmost importance. You don’t have to spend $700 to avoid a toxic crib mattress. Please read on for more information about why I strongly recommend non-toxic, organic crib mattresses for babies and toddlers, as well as my list of vetted mattresses starting at just under $300. Why Do Crib Mattresses Contain Toxic Flame Retardants? What are the Best Non-Toxic Organic Crib Mattresses? Should You Choose a Latex or Innerspring Mattress? What About Less Expensive Organic Crib Mattresses? Organic on the outside (but toxic on the inside). A lot of companies call their mattresses “organic”, when in fact only the outside cover is organic. Unfortunately, this is a very effective greenwashing technique, because most people don’t realize this only applies to the cover and not the rest of the mattress. Please pay close attention to all of the materials used. Even if the outside cover is made from organic cotton, the inside may still be polyurethane foam, or it may contain other chemicals or materials of concern. Polyurethane foam, soy foam, or vegetable-based foam. Polyurethane foam is a highly flammable petroleum-derived material that emits VOCs and is often treated with flame retardant chemicals. Even so-called “soy-based” and “plant-derived” foams are polyurethane foams mixed with these other elements for marketing purposes (aka greenwashing). Even though many foam mattresses are now certified by Certi-Pur or Greenguard, it is important to consider that these certification programs (while helpful) do not test for every possible toxin or contaminant. Waterproof mattresses. While a waterproof mattress sounds like a good idea, most waterproof mattresses are made with vinyl, a highly toxic plastic that contains chemical additives such as heavy metals, phthalates, and organotins. Vinyl is known to be the “most toxic plastic” and it “releases some of the most toxic chemicals on the planet that have been linked to cancer, birth defects and other serious chronic diseases.”  For this reason, please avoid waterproof mattresses and instead use an organic waterproof mattress pad. 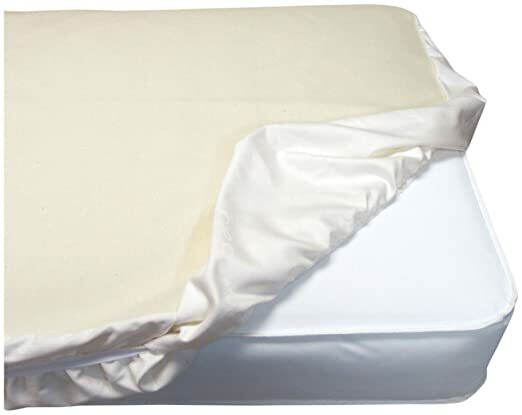 Here is another wonderful organic waterproof mattress pad that works really well. If you feel strongly that you need a waterproof mattress, the only brand I would consider at this time is Naturepedic, since their waterproof mattresses use food-grade polyethylene instead of vinyl. Flame retardants. Mattresses are often treated with flame retardant chemicals to meet federal flammability regulations. However, manufacturers can meet these regulations without the use of toxic chemicals. If you’ve read any of my other articles, such as my car seat article, you’ll know that I am adamantly against the use of chemical flame retardants in children’s products. Problem #1: The flame retardants themselves are highly toxic, accumulate in our bodies, and have been associated with a variety of serious health concerns. So, how do these chemicals find their way into our bodies? Since foam is treated with flame retardants during manufacturing (as opposed to being bound to the materials), the chemicals break down and off-gas, polluting the air and dust in our homes. This is worrisome for babies and children, who have been found to have very high levels of these chemicals in their bodies from hand-to-mouth transfer . How? Babies and children crawl on the floor, put their hands in their mouths, and play with toys that have accumulated household dust. But, this is also especially dangerous if your baby sleeps on a mattress loaded with flame retardant chemicals because they are directly being exposed to these chemicals for several hours each day while they sleep. It goes without saying, but I’ll say it anyway: we don’t want this near our babies. Problem #2: These flame retardant chemicals are ineffective. The same toxic, harmful chemicals that are being used to comply with mattress flammability standards are ineffective at preventing fires from spreading. Recent studies suggest that the chemicals may not effectively reduce the flammability of treated products. While we can’t wave a wand and change these flammability requirements, and can’t ensure that every item that comes into our homes isn’t treated with these harmful chemicals, we can make it so that a baby’s sleeping surface is not one of them. Thankfully, there is a way to avoid the use of these harmful and essentially ineffective chemicals when purchasing a crib mattress. Just like with car seats, mattress manufacturers can meet the government’s strict flammability standards without the use of harmful flame retardant chemicals. Non-toxic, organic crib mattresses are the safer option. I’ve seen crib mattresses range in price from $30-$700. When it comes to crib mattresses, I firmly believe that you get what you pay for so it’s important to invest in your crib mattress. However, you do NOT have to spend $700 on a crib mattress. In fact, I left off some more expensive mattresses simply because there are good options at a lower price point. I believe in frugality when it makes sense, and you can still buy a safer mattress without overspending. All crib mattresses should have a snug fit that passes the two-finger test: there should be no large gaps and you should not be able to insert more than two fingers between the mattress and the side of the crib. Most cribs are made to fit a standard crib mattress. Ok, on to the good news — we have lots of great options when shopping for non-toxic organic crib mattresses. Here are my favorites! Read on below for an overview of these mattresses, check out what each is made from, and find the right one for you. The mattresses listed here do not contain chemical flame retardants; according to their manufacturers, each meets the flammability requirements naturally by integrating fabrics that resist flammability without the need for added chemicals. This particular Naturepedic crib mattress has 252 coils and an organic cotton filling that is free of bleaches, dyes, synthetic pesticides, herbicides, and chemical fertilizers. This steel innerspring mattress contains no polyurethane foam and has an organic cotton exterior, meaning there is no PVC or vinyl used. This mattress contains absolutely no flame retardant chemicals. 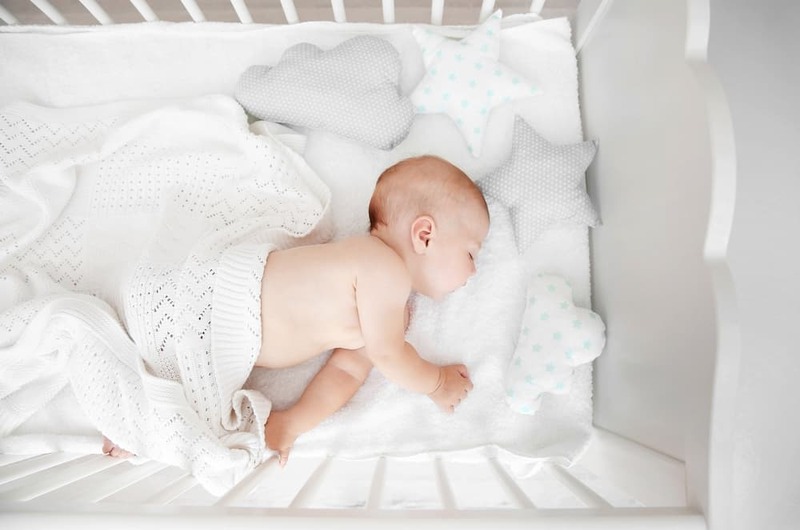 Naturepedic crib mattresses have GREENGUARD Gold Certification, use GOTS-certified materials, and are certified to be formaldehyde-free; the company regularly tests their products for chemical emissions. Through extensive research and creative product design, we have completely eliminated the need for flame retardant chemicals and chemical flame barriers in our products. We use materials like organic cotton fabric, organic cotton batting, plant-based non-GMO PLA batting, and steel innersprings in place of polyurethane foam and synthetic fabrics with a higher fuel load. Our materials tend to smolder instead of burst into flame, which provides valuable time for you to get your family out of the house if there is ever a fire! We have used this mattress since day one, and I’ve been very happy with it. We continue to use it after 4 years and have had no issues, even after my toddler discovered that he likes jumping on his bed. Some reviewers have complained that the mattress has an indentation after a short period of use; I didn’t experience this myself, but I also understand that Naturepedic has great customer service. 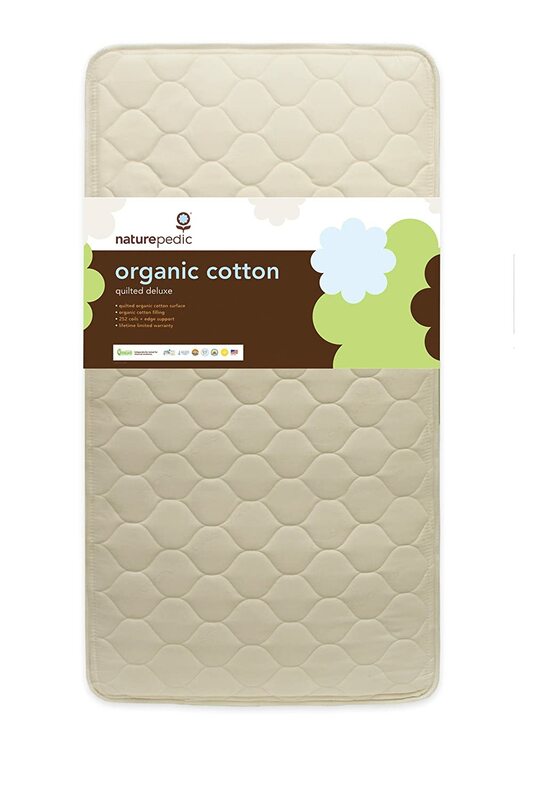 Don’t forget: If you’re buying an organic, non-waterproof mattress such as this Naturepedic, make sure to get a Waterproof Fitted Crib Mattress Pad (which itself is partially organic). Naturepedic also sells a Classic version of this mattress that has a wipe-clean waterproof surface made from food-grade polyethylene (derived from non-GMO sugarcane) that does not contain any flame retardants or phthalates. Another excellent option is the Emily Natural Crib Mattress, a 150-coil innerspring mattress made with all-natural materials. The Emily mattress is made in the United States using GOTS-certified organic cotton and Oeko-Tex certified natural wool. Since the mattress cover is made with wool, the mattress is naturally flame retardant and requires no chemical flame retardants. Made without the use of polyurethane foam, there are no petrochemicals in the Emily Crib Mattress. The mattress is GREENGUARD Gold certified. MyGreenMattress only uses “eco” wool sourced from Northern California and Southern Oregon, and absolutely no harsh chemicals, dyes, or bleaches are used during the processing of the wool. The wool is also free from chemical pesticides, herbicides, antibiotics, and hormones and each batch is tested at UC Davis’ Animal Toxicology Lab for herbicides, pesticides, and naturally occurring heavy metals such as lead and arsenic. (Yes! Love this!) Wool is naturally resistant to mold, mildew, and dust mites, which are obviously unwanted in your baby’s sleeping surface. The mattress was redesigned in December 2018 and now features a GOTS-certified coconut coir blended with GOLS-certified natural latex. This provides more even weight distribution. DEAL ALERT! Save $35 with my Emily Crib Mattress coupon code GN35 through this link. It gets excellent ratings for having just the right level of firmness. They also make mattresses for adults (we have the Natural Escape and love it!). MyGreenMattress offers a 10-year warranty and a 100-night guarantee for all its mattresses, providing you 100 nights to try the mattress with an opportunity to exchange or return your mattress at any time during the trial period (one return or exchange per household). This mattress is the least expensive mattress on this list, and the company also offers a no-interest payment plan. The Emily Natural Crib Mattress was inspired by the company founder’s daughter, who suffered from eczema and allergies. Emily inspired their family to switch to an all-natural lifestyle, and the Emily Natural Crib Mattress was created. Based in Washington state, Soaring Heart mattresses are made by hand in their Seattle showroom. This company is the real deal – there’s no greenwashing here. Soaring Heart’s 100% organic crib mattress is made with Global Organic Latex Standard (GOLS) certified natural Dunlop latex, organic wool sourced from New Zealand, and organic cotton grown in Texas. Soaring Heart is devoted to helping its customers get a great night’s sleep. They hand-make all of their products to order and work closely with their suppliers to ensure that only the highest quality materials are sourced. They’re backed by over 30 years’ experience in mattress craftsmanship and truly care about their customers. Soaring Heart also offers a generous 20-year warranty on their products and a 30-day comfort guarantee. This is a great mattress choice! The Pure Start crib mattress, a firm innerspring mattress made with organic cotton and wool, is their best seller. Their PureGrow wool is processed without the use of any chemicals and offers natural flame retardant properties, meaning that SleepLily can skip the toxic flame retardant chemicals. A few other cool things to know about Sleep Lily: mattresses are made to order, by hand in California; all orders receive free shipping; and the company offers a 90-day trial so you can try out the mattress and exchange it for another one if it doesn’t work out for you. Hopefully, we’ve ruled out foam as an option for your baby’s crib mattress and you found some great alternatives above. On my list of safer organic crib mattresses, I’ve included only innerspring and latex-based mattresses, and both offer great options based on your own needs and preferences. We’ve tested for EMF…immediately above an innerspring mattress (i.e. where a person would be sleeping), and then repeated the test in the exact location but with the mattress removed. The EMF field does not change…. The EMF in a space is not affected by the presence of an innerspring mattress present. The innerspring is NOT amplifying, attracting, or magnifying EMF beyond what’s already present. Though I haven’t done my own testing (yet), I remain unconvinced that innerspring mattresses amplify EMF waves. Still, the research is ongoing; if you are concerned and prefer to play it safe, you can just buy a latex-based mattress. (If you’d like to do your own EMF testing at home, grab this inexpensive monitor or invest in this one.) Otherwise, the choice between latex and innerspring mattresses mostly comes down to price and preference. I have done a thorough search of organic crib mattresses, and some of the mattresses that I considered, but didn’t include on this list include the Oeuf mattress, Babyletto Pure Core Non-Toxic Crib Mattress, and any mattresses made by LA Baby, Sealy, and Colgate. I know, I know – the mattresses I listed are expensive. High-quality organic crib mattresses are a bit pricey, and I know it can be cost prohibitive! I’m on the hunt for an organic crib mattress that’s below $200, but so far I haven’t been impressed by the options out there. If cost is preventing you from getting the mattress you prefer, I would recommend adding gift cards and a crib mattress to your baby registry. Hopefully some generous friends and family members will help you get the mattress you’re hoping for; if not, you may be able to use Amazon’s 15% completion discount to save a little extra on your preferred mattress. Which mattress did you decide on? Wishing you and your baby great sleep! Hello, Thank you for this truly excellent website. It has helped me make all my nursery product decisions. Can you let us know if the “Bundle of Dream Flagship Crib Mattress” would make your list? Their website doesn’t have enough detailed information for me to tell. I am leaning towards the Emily Crib Mattress, but first want to know if the Bundle of Dreams mattress (which is cheaper) is just as good. Thank you!! Hi! Thank you for the post! I find it very helpful! How do you feel about the Sleepyhead brand? I know it’s not exactly a mattress but was thinking of using it as such. Thank you! I’m personally a fan of these sleepers. We used the Snuggle Me Organic and I think they’re all great. I used them for supervised naps. I am doing a lot of research about what crib mattress to buy for my toddler…. but I dont want to stay in a budget! It seems like all of the ones listed here are out of my budget. I guess in that case I am looking for an “good enough” mattress at this time. What do you think of the Delta Children Twinkle Stars Supreme Innerspring Crib and Toddler Mattress | Waterproof | GREENGUARD Gold Certified (Natural/Non-Toxic). Or do you have a better option that will keep me under $200? To buy non toxic. I would move funds from other products to the mattress for that reason. You could also wait to see how and where your baby sleeps and then buy a mattress when you get a sense for whether they will sleep in the crib. Hi and congratulations!! I know less about these but why don’t you look into the Happsy (https://amzn.to/2JHvQkZ) and the Lullaby Earth (https://amzn.to/2ydqDf6)? The Happsy is apparently being discontinued so don’t wait too long if you plan on getting that one. Mixed reviews on the Lullaby Earth mattress but I believe it is actually made by Naturepedic. Otherwise, MyGreenMattress does offer a payment plan if that helps! Good luck deciding and let me know if you have any more questions. 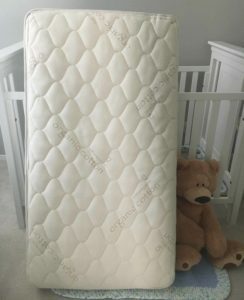 We’re moving our 7 month old baby out of a mini crib into a full size crib and need to buy a new mattress. We have Babyletto Coco Core mini crib mattress. Based on my research, our best bet is a non-waterproof, no coils Naturepedic or far superior GOLS certified latex from Soaring Hearts, Omi/Lifekind, Holy Lamb Organics etc. We want to buy a mattress that will also be used as toddler bed. I’m torn as what to buy. Like you, I’m not crazy about the plastic used in Naturepedic, however, a possible latex allergy and MOLD is very concerning to me with a latex mattress. What should we buy? Hi! The deluxe Naturepedic linked above doesn’t have a plastic outer layer. I’d go with that or the Emily Crib mattress. Thank you. I’ve read some complaints on Amazon that the Naturepedic Quilted is not firm enough for infants. What’s your experience? Also, what is your opinion on the Natural Coco-mat? Hi Daphna, we haven’t had any issue with the firmness on our Naturepedic but I have also heard this. What about the Emily mattress? The coco-mat mattress looks good! Hi! Love the article and feel so much better about making a decision now for the right crib mattress. I have a question though- I am looking at this Naturepedic classic 150 seamless 2 stage mattress – but it says it contains polyethelane. What is that and is that bad ?? Hi Sarah, I’m so glad to hear that. The crib mattress is one of the most important purchases you’ll make for your baby! So I would recommend one of the mattresses that isn’t waterproof, since the waterproof ones use polyethylene (a plastic used to create a waterproof barrier). Though it’s possible that this barrier layer isn’t harmful, I’m personally not comfortable with any plastic on a baby’s sleeping surface. What’s your budget for a mattress? Hello and thanks for your terrific website! I bought the Emily mattress for my new daughter, she’s yet to use it, but it seems to me like it’s not particularly firm. When I lay her on it, she seems to sink in just ever so slightly. It’s certainly “firm” but not overly firm like some of the mattresses I’ve seen at BBB. Thoughts on this? Hi and thanks for the kind words! I would double check with the manufacturer on that. They’re very helpful and friendly. Let me know if you don’t get much info back from their customer service team. But I would add that if you’re comparing it to foam mattresses, they’re not apples to apples. Foam will be likely always be firmer. But you still don’t want a saggy mattress, so it’s worth checking with them. Maybe take a photo of her laying on there and see what they think. Good luck and let me know if I can help more! Hi! I’m undecided on the Newton Wovenaire. It’s made from a plastic polymer, but it is very breathable. I’d say neutral ???? but unless I get some new info I can’t really make a decision to recommend it. I am thinking of buying a Babyletto Pure Core. Why does it fall short from making this list? Thank you for writing this article as it was very informative! Going to go with the Emily, do I still need to buy a waterproof mattress cover like the Naturepedic one you suggested? Any recommendations for a non-toxic changing pad? Hi – Wondering if you know of any good organic options that come in the “mini” crib size? Have you seen any others? From what I can see online, that is only 2″ thick and more of a pad. Ideally looking for something more substantial, but having trouble finding anything online. This one is 3” but it contains polyester: http://amzn.to/2C2Hy5I. And this one is 5” but also contains polyester: http://amzn.to/2DrkKJg. I’ll let you know if I find any others! Thank you for the article! What do you think of the moonlight slumber starlight premium in terms of non-toxic? To use for new-born? Thank you! Hi Selina, though it is greenguard certified, I am not a fan of this line of mattresses. They contain foam and plant-based or not it is still petroleum-based. Thanks so much for this informative post. We are researching an organic crib mattress and your article was very helpful! Hi Elizabeth! I’m so glad the article was helpful. Have you decided on a mattress yet? What would you recommend when it comes down to Emily Natural Crib Mattress or SleepLily Pure Start – Non-Toxic Crib Mattress? I am curious to know if you were to choose which would it be between the two and why? Thank you and great Article btw. Hi Antonio! Thanks for your feedback on the article. I’m glad it’s helpful! So this is a great question and I think it comes down to a couple factors. Do you prefer a wool or cotton cover? And do you want greenguard certification? Right now the Pure Start mattress is sold out too so keep that in mind. I’d probably get the Emily because I know it’s certified by Greenguard. But both are good options. The Emily also has 150 coils which is quite dense. What do you think? Let me check with the manufacturer. I don’t think it’s necessary (our Naturepedic isn’t double sided, for example) but let me get right back to you on that. I have read that during the first year or two before toddler age the mattress should be a bit firmer and once toddler age the mattress should be softer? How does the Emily Mattress comply with that? Or what is the solution to that? I have also heard that the spring mattress to tend to sag.. what is the solution for that? MyGreenMattress (the manufacturer) confirmed the mattress is suitable for both babies and toddlers. Not all mattresses are dual firmness, but I agree that babies *need* a firm sleeping surface. As for sagging, I would contact the manufacturer of any mattress if you experience that. I’d recommend that you rotate the mattress whenever you change the sheets to prevent any sagging, but you shouldn’t experience any. Hope that’s helpful. Let me know if you have any other questions! Great article. Im debating the Nook Pebble but it does have Polyester listed which Im not sure on? What is your thoughts on Newton Wovenaire Mattress? Hi Angela! Thanks so much. Are you looking at the Pebble Air or Pebble Pure mattress? I like the Pure but don’t recommend the Air. As for the Newton, the concept sounds amazing but I wasn’t able to get any clarity on whether the materials are actually safe. I was on the fence about listing it here but didn’t because I wasn’t confident in the mattress’ safety. The company assured me it was safe but I felt like I had some unanswered questions. Have you considered the Emily Natural Mattress? This is a great resource. I used a hand me down crib and mattress (still pretty new) but would have bought one of these had I known. A selection of a crib mattress for the newborn baby in an important issue. There are many options when it comes to choosing best crib mattress according to our need, space, quality & Price. Thanks for helping to make the decision. It’s really helpful to choose best crib mattress to buy. Thanks! Glad you found it helpful. Please let me know if you have any questions. Glad to hear it! Which one did you buy? What a great list for new parents who have their babies in cribs! We are co-sleepers in our house, but I know this will be a wonderful resource for families who aren’t. Thanks! Out of curiosity, what do you do for naptime? wow, this is packed full of info! I haven’t used a crib mattress for a few years because my kids are co-sleepers but this is a great post! Thanks mama! My kids like to cosleep too but I have them in the crib or bassinet for naps. Such great info. Thanks for sharing. Wish I had known better when my children were babies. I know the feeling, mama. Many of these companies also make regular sized mattresses, FYI. What a wonderful and informative post ! If we have another baby I will be most definitely coming back here to check out those mattresses! Thanks mama! Some of these companies also make adult mattresses if you happen to be in the market. I can’t wait to upgrade my own mattress. this is a great resource for new parents- I didnt even know some of this! It’s something we shouldn’t have to think about, but sadly do. I can’t wait for this to change! So much that I didn’t know there was to consider when buying a mattress. Thanks for compiling all the information. Isn’t it eye opening? I’m glad it’s helpful and I’m glad we have good healthy organic crib mattresses as an alternative to traditional options. GREAT post! So informative. I wish I would have known all this when I was getting ready to have my girls! Sounds like you’ve done your research. Kudos! Thank you for this great share. With Baby #2 coming in a few days, I’ll definitely be looking into this mattress for his crib. That’s great! Let me know if you need any help choosing a non-toxic crib mattress from this list.